Meanwhile, on the parallel reality show known as Top Enthusiastic Bus Rider, Team D&D got stuck with a sub-par city that hampered their challenge performance. Now, don’t hate me, Washington D.C. denizens- I’m not saying it’s a bad city, I’m saying it’s kind of a terrible city when your other two alternatives are Baltimore (DURING OTAKON, which is critical) and NYC. Of course, Team Mangaloids in the Big Apple didn’t go to any of the venues I would have expected- I was thinking they would stop by Kinokuniya NYC, a great Toy Shop called Toy Tokyo, or maybe some of the better-known comic stores that carry lots of manga, but no dice. Instead, they go to a Lewis-Caroll inspired tea-shop (which I’d heard of before and looks awesome and delicious, but I think the otaku connection might be kind of tenuous even for me) and a ninja-themed restaurant, which was amazing. It’s like the PSX Tenchu games, only they feed you. I honestly can’t believe I’ve lived within easy commuting distance of NYC for this long and actually hadn’t heard of this awesome restaurant with ninja waiters that do tricks and light things on fire- that said, I’m probably not going to go because I’m too chicken. 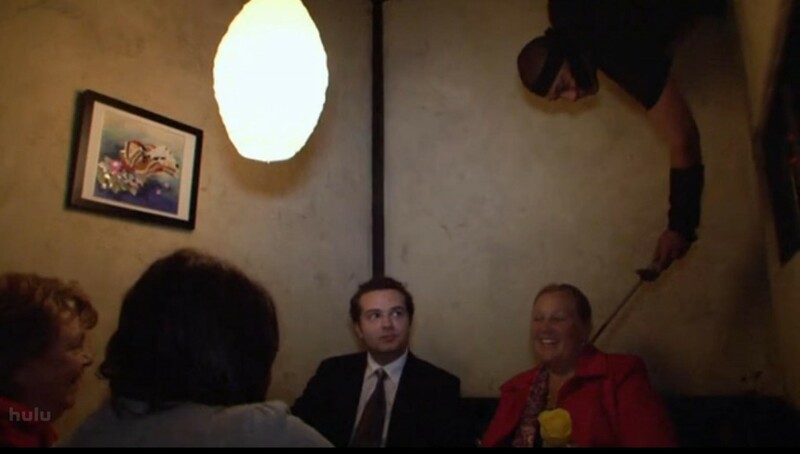 I’m notorious for freaking out terribly whenever anyone sneaks up behind me, so this place would be like some weird combination of Japanese-restaurant-nirvana and a hell dimension crafted just for me. See, it's nonsense like this I just can't abide by- these people are trying to EAT. I was also a tad disappointed with the Otakon 2010 coverage, not only because I wasn’t in it, but because they didn’t show the tremendously frightening fire alarm scare that caused thousands of cosplayers to pour out onto the street like several packs of hungry wildebeasts. Now, I’m not a filmmaker, but if I was making a documentary and that just happened to be going on, I would take note. I realize I now officially care more about this stupid contest than everyone who was ever on the bus put together, but there does seem to be some method to the “challenge” business; the wins for the individual teams do count towards an overall score. Right now, Team D&D are in the lead with two challenge wins; let’s see if Levy keeps nerfing their challenge-winning powers by continually sending them to nowheresville. I know, I know, it’s supposedly random, but I’m wise to Tokyopop and their tricks. 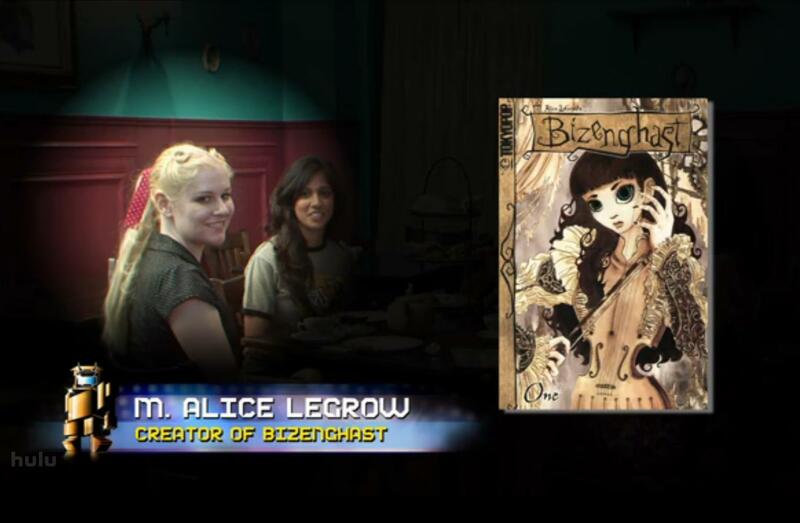 This episode also had the distinction of being co-hosted by M. Alice Legrow, creator of the Bizenghast manga. While this was a good thing, I think Alice (M. Alice? Ms. Legrow?) was underutilized- she didn’t get to do anything when she met up with the Mangaloids in NYC, and we didn’t really see much of her until the end credits montage. I think this was a minor editing issue- or a major editing issue, if you’re a Bizenghast fan. Time for a barely-relevant side story: I once worked at a Barnes and Noble that had a Bizenghast standee on display; apparently, Legrow called and requested the standee, because she hadn’t received one from Tokyopop, and she came and picked it up. And they said I wasn’t a manga-industry insider! Best:The interview with Natsu Onoda Power, who has one of the world’s cooler cross-cultural names. Her book on Tezuka now occupies a high place on my soon-to-read list. Also, even though it was once again on the fringes of otakudom, Stephan and Sully’s visit to the Geppi Museum was fun. Actually, when Sully pointed out the Batman comic, it occurred to me that he has pretty much the perfect voice and demeanor to pull off the Robin “Holy Cattle Ranchers, Batman!” thing. 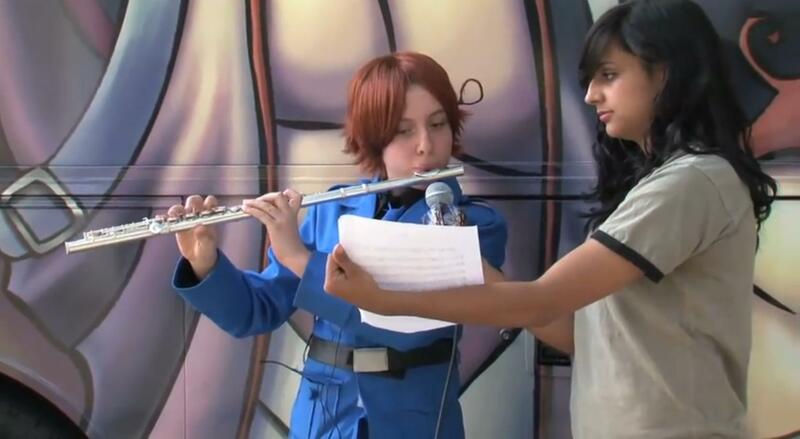 Worst: The fact that NYC and Otakon shared ONE EPISODE. I kind of admire the show for giving those two venues no more time than say, Louisville and Oklahoma City for the sake of treating the whole nation with otaku respect, but is it realistic? They could have filled an entire episode just with Otakon, and it would have been totally justified; meanwhile, I’m not psyched about the locations next week, but maybe I’ll be surprised. This week, I’m going to do something I probably should have been doing all along and comment a bit on the actual AGO contestants. Now, before anyone gets miffed, I’m just commenting on the strength of their “otaku factors”, or rather their chances, in my eyes, of wearing the America’s Greatest Otaku crown. Or bunny ears. Or giant Luffy-hat. I love how all plans for future anime/manga always sound like they came from amazing fever dreams, and that’s not a knock on Jasmin because they ALWAYS, ALWAYS sound like that. If the premise for your manga sounds like it makes sense intrinsically, I don’t know what you even think you’re doing. 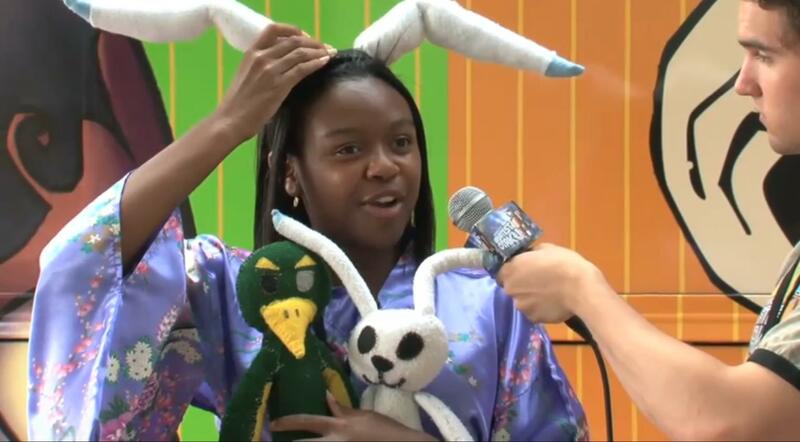 I think Jasmin, along with several of her fellow contestants from previous episodes, does a good job of proving she’s a creative and passionate individual, but not necessarily the height of otaku-dom. I think a lot of these folks are creative people who would have found an outlet even if they had never discovered anime, since they tend toward their own original projects- and there’s nothing wrong with that whatsoever. Actually, in my personal opinion its preferable to go your own way, but the idea behind America’s Greatest Otaku is that you’re the greatest FAN, not necessarily a great creator. Being a great fan includes creativity, but you get my drift. Chances of Winning AGO Bunny Ears: Fairly low. 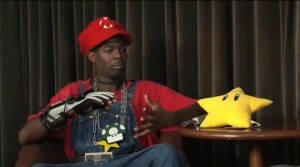 I’ve pointed out my concern with assuming that otaku are social creatures by nature above. However, when you’re trying to nail down what makes someone the otaku-to-end-all-otaku, perhaps it should be the person who begats more otaku spawn on top of everything else they do- I can’t really find a problem with that. Plus, name-dropping Captain Harlock as an early favorite puts him in a pretty elite group. Dre takes his hat off to him, and if I ever wore a hat, I would as well. Chances of Winning AGO Bunny Ears: High. With his combination of community spirit, great-but-simple cosplay and being able to cite some perennially overlooked anime classics as his favorites, I would not be at all surprised to see him win. I think some of the younger contestants, like Dianna, are at a bit of a disadvantage here. Honestly, I think the only way a teenager would win would be if they went out of their way to cancel out their relative youth by watching all that obscure anime from the ’70s that even people who were around then don’t remember. Still, the anime song-playing plus plushie-fanart is a pretty unusual and potent combination, and she seems more dedicated than some of the other young contestants we’ve seen. Besides, I try to block out all of the Hetalia stuff I see because I literally do not understand it one iota, so the fact that I was able to watch her performance through my self-induced Anti-Hetalia Field speaks well of her. Chances of Winning the AGO Bunny Ears: Fair. I don’t think it’s likely, but she’s got a shot. I will go back and assess the candidates’ from previous episodes chances of winning in the event that I feel like it.